The Ladder of Divine Ascent is an ascetical treatise on avoiding vice and practicing virtue so that at the end, salvation can be obtained. Written by Saint John Climacus initially for monastics, it has become one of the most highly influential and important works used by the Church as far as guiding the faithful to a God-centered life, second only to Holy Scripture. There is also a related icon known by the same title. It depicts many people climbing a ladder; at the top is Jesus Christ, prepared to receive the climbers into Heaven. Also shown are angels helping the climbers, and demons attempting to shoot with arrows or drag down the climbers, no matter how high up the ladder they may be. Most versions of the icon show at least one person falling. John, whilst a hermit living at the Sinai Peninsula, was recognized for his humility, obedience, wisdom (which was attained through spiritual experience), and discernment. He already had a reputation for being extremely knowledgeable about how to practice a holy life. St. John, igumen of the Raithu Monastery, one day asked St. John Climacus (also known as John of Sinai) to write down his wisdom in a book. At first hesitant to take on such a task, John of Sinai eventually honored the request, and he proceeded to write The Ladder. 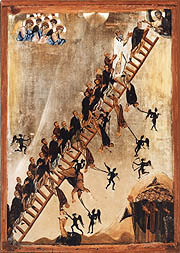 St. John Climacus received his name "Climacus" ("of the Ladder") because of this work, and his writing The Ladder (later called The Ladder of Divine Ascent) has been compared to the Holy Prophet and God-seer Moses receiving the Law. This work was initially used by monastics. In fact it is read by monastics to this day during the Great Fast. It is also suggested as Lenten reading for those who are still "of this world"; yet this should be done with caution and under the guidance of a spiritual father. This work has made its mark on the lives of innumerable saints, including St. Theodore the Studite, St. Sergius of Radonezh, St. Joseph of Volokolamsk, St. Peter of Damascus, and St. Theophan the Recluse, amongst many others. The aim of the treatise is to be a guide for practicing a life completely and wholly devoted to God. The ladder metaphor—not dissimilar to the vision that the Patriarch Jacob received—is used to describe how one may ascend into heaven by first renouncing the world and finally ending up in heaven with God. There are thirty chapters; each covers a particular vice or virtue. They were originally called logoi, but in the present day, they are referred to as "steps." The sayings are not so much rules and regulations, as with the Law that St. Moses received at Sinai, but rather observations about what is being practiced. Metaphorical language is employed frequently to better illustrate the nature of virtue and vice. Overall, the treatise does follow a progression that transitions from start (renunciation of the world) to finish (a life lived in love). Like with other ascetical and spiritual texts, this one should be read carefully. Since the original audience was those practicing the monastic life, the language is very strong when contrasting the life of the world and the life devoted to God. This is one of the reasons why this work should be read under the guidance of a spiritual father. This work can be read at once with careful attention and intense concentration, trying to replicate as much as possible the monastic life. Yet it can also be read in its individual steps as well. The bottom line is that a spiritual father should be there as a guiding hand with this work. The Ladder of Divine Ascent, published by Holy Transfiguration Monastery. (ISBN 0943405033) This edition, based on Archimandrite Lazarus Moore's translation is generally preferred over the Paulist Press edition of the Ladder—especially because of the verse numberings, which are the standard way of referencing Climacus' sayings (these are also present in older versions of Archimandrite Lazarus' translation). It is also physically beautiful and much nicer to have on one's bookshelf. It contains an icon of "The Ladder," many other embellishments, and is printed on high quality paper. All that said, the Paulist Press edition is also worth having, especially because of the helpful introduction by Bishop Kallistos. This page was last edited on October 27, 2012, at 21:38. This page has been accessed 154,171 times.